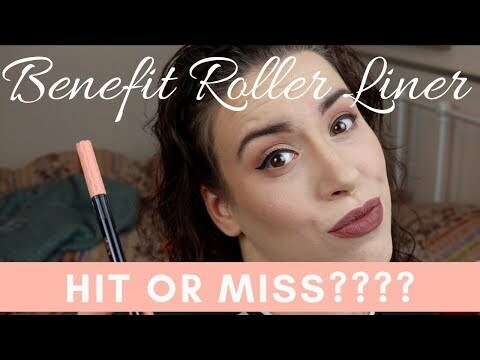 I was lucky enough to get picked to review the Roller Liner True Matte Liquid Eyeliner 1Ml - Black - Benefit ..and here are some of my thoughts! I love the eyeliner beacause it was so smooth to use! The tip was so soft and easy to manoeuvre without tugging at my skin. The blackness of the liquid was everything I look for in an eyeliner, true matte black! It had great staying power and wasn't too drying on my eye, I would recommend setting the eyeliner with a little bit of black eyeshadow on the inside corner if you're going to be wearing for a long time as this could help keep it put even longer. I would definitely reccomend this to a friend because it is so easy to use and has amazing colour payoff and staying ability! I would love it if you guys would check out my review on YouTube also, I am loving reviewing products over there too & would love for your feedback! Love your review and the liner, it is my favourite eyeliner, I have it in brown aswell as black and have recently been able to do a winged eyeliner for the first time, I find that eyeliner better than the Benefit They're Real Liner as I found that the They're Real Liner tends to smudge and is transfer proof whilst the Roller Liner does not budge until removal. Loved watching your youtube review of the Roller Liner. What lip colour are you wearing in the video? It's a lovely shade! It really suits you. I will have to have a look out for it .